In The Fencer (Miekkailija), which has recently been issued as a fine-looking DVD from Music Box Films and is also available to watch via various VOD platforms, Endel Nelis (Mart Avandi) has returned to his Estonian homeland in 1952 under an assumed name and a changed identity. He has good reason for the deception, as the film eventully explains. The small town where he finds himself is markedly more quiet than the big-city hustle of Leningrad, where he had been previously hiding. A phone call to a friend back in the city reminds him of his dire and dangerous circumstances: he must lay low, avoid calling attention to himself, and thus hope to avoid detection by the authorities who are earnestly seeking his capture, for reasons not yet explained. Endel immediately foresees that his new job as a physical education teacher at the town’s only middle school will be challenging, to say the least. His worst suspicions are quickly confirmed. His first day of class, spent with children — he does not like children — is aggravating, and his discovery that the school ‘shares’ all sports equipment with a military base nearby, which naturally takes priority, leaves him frustrated. To add to his grief, the school principal (Hendrik Toompere) manifests strong hints of jealousy and suspicion. 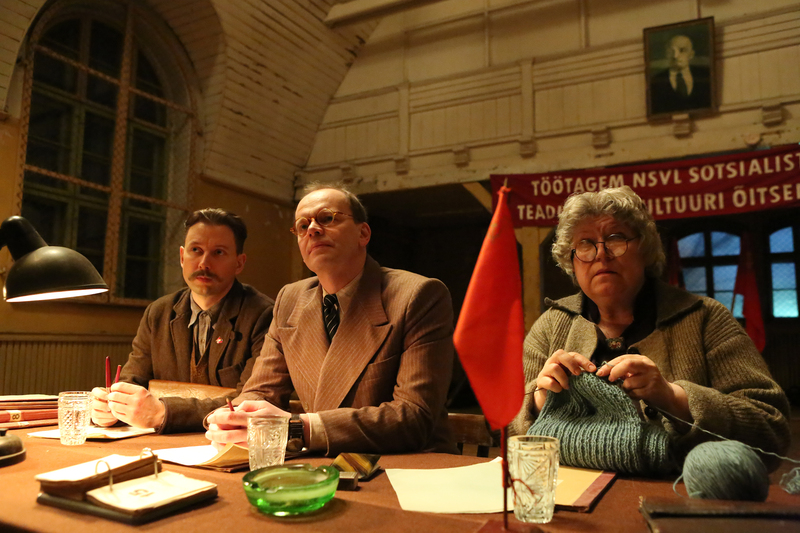 During World War II, Estonia was invaded first by Germany and then by the Soviet Union, which has imposed its Communist rule upon the people; the principal appears to be under the full sway of the Soviet government, which makes Endel doubly nervous. 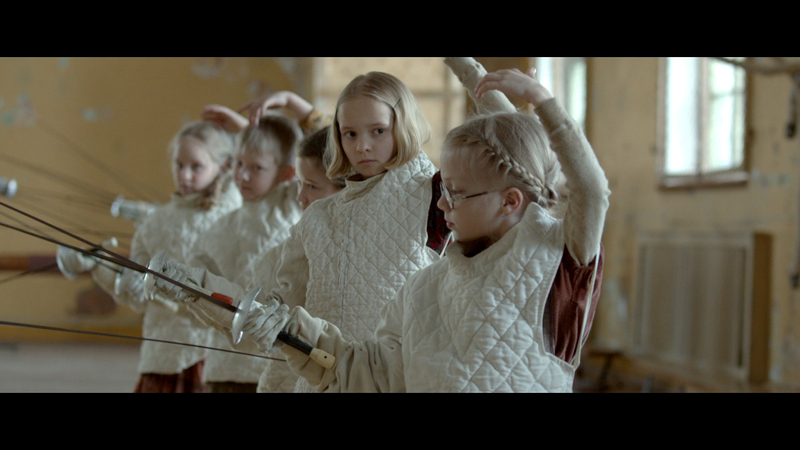 Then a little girl named Marta (Liisa Koppel) spies upon him as he takes out some of his building frustration with the use of a fencing sword. Endel’s life course is soon bending toward something different than what he might have imagined. As his Leningrad friend suggests, Endel needs to focus on something to help him acclimate to his new surroundings and blend in as best as possible. With precious few distractions available in town, and ample experience, Endel seizes upon fencing, perhaps as a quick fix to avoid driving himself insane, and begins teaching a class of children the basics. One thing leads to another, and The Fencer, which is inspired by a true story, soon takes on the form and basic arc of a sports drama. Still, there are sufficient reminders that this is only a brief interlude to lend the narrative dramatic heft, helping to lift it above the ordinary. Written by Anna Heinamaa and directed by Klaus Haro, the film is exquisitely framed and expertly photographed by Tuomo Hutri, with lovely production design by Jaagup Roomet. The muted colors serve as a symbolic reminder that the country was under foreign rule. Yes, life could be enjoyed, but shadows and clouds still hovered on the horizon, always ready to move in quickly and dampen dreams of the future. The colors look absolutely splendid on the new DVD from Music Box Films. The package includes an interview with director Haro; select scenes with his audio commentary on them; and the theatrical trailer. The film is also available to watch on various VOD platforms, including GooglePlay, iTunes, Vudu and YouTube. The Fencer is warmly recommended, even for people who don’t like children.